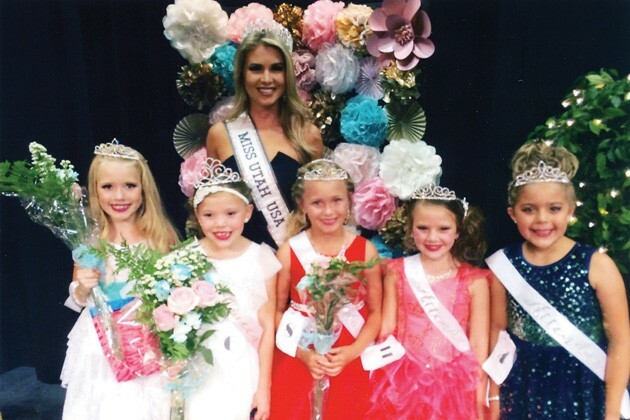 Pictured, from left to right, are Junior Little Miss Grantsville attendant Phoebe Davies, queen Sadie Mouritsen, Miss Utah USA Teale Shawn Murdock, Junior Little Miss Grantsville attendant Hannah Miller, attendant Haizlee Hall and attendant Taytum Mondragon. 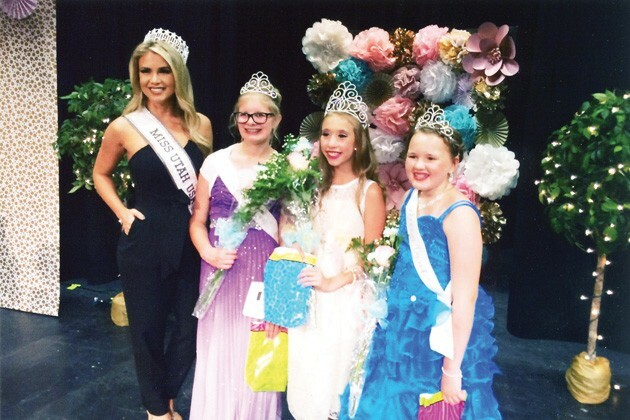 Pictured, from left to right, are Miss Utah USA Teale Shawn Murdock, Senior Little Miss Grantsville attendant Hannah Patterson, queen Chloe Davies and attendant Hilda Penney. Eighteen girls participated in the 2016 Little Miss Grantsville Pageant, held at Grantsville High School, as part of Grantsville’s Fourth of July celebration. The contestants were judged by three out-of-town judges, including the reigning Miss Utah USA, Teale Shawn Murdock. The girls were judged on a personal introduction, talent, party dress presentation and an on-stage question. Junior Little Miss Grantsville was chosen from girls in grades 1-3, and Senior Little Miss Grantsville was chosen from girls in grades 4-6. During the contest, 32 “Tiny Miss” girls ages 2-6 took part in a party dress competition. The 2-3-year-old queen was Kodi Nielson, and her attendants were Hadlee Barker, Journee Hebdon and Miya Martello. The 4-5-year-old queen was Addison Holste, and her attendants were JaeCee Sullivan and Preslee Dahl. The 6-year-old queen was Emree Howard, and her attendants were Taylor Fawson, Haeley Herren and Haedyn Herren.